You are probably familiar with the following situation: when comparing prices of hotels, tour operators, travel agents and online booking portals you always find price ranges for one and the same equivalent room. We always guarantee the best rate when booking through www.aohostels.com. The prices are displayed transparently so you can choose the right room. 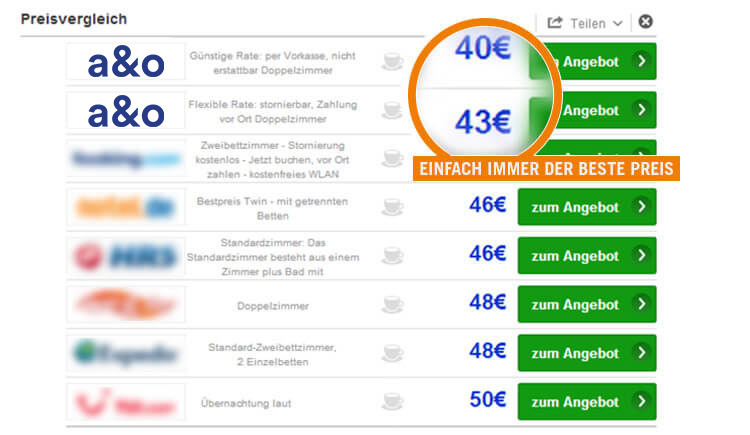 You can avoid these price differences quite easily by booking directly at a&o. This eliminates the costs incurred for portals and third parties, and you save even more on your stay with the same quality standards! ✓ Booking at a&o directly is always favourable because commissions through third parties can be avoided. ✓ For direct bookings, a&o is your personal point of contact and no medium in between. ✓ You get another 10% discount on the total price if you choose an immediate payment method (e.g. via PayPal - See fix rate). ✓ You get much better cancellation conditions via a&o (see Flex rate). ✓ You benefit from special offers, such as the a&o Traveller Card. ✓ a&o offers cooperation agreements like the 12% ADAC discount or 10% InterRail discount. In the unlikely event that you should find a room still cheaper than ours online, we take care of it immediately and check the details for you. Simply write us using our contact form.